That's all from me. I'll be back tomorrow with more Premier League action as Fulham take on Liverpool (14:15 GMT) and Chelsea travel to Goodison Park to face Everton (16:30 GMT). I'll be kicking off the build-up around midday. In the meantime, check out all the match reports from today's matches. And of course, go over to the FA Cup live, where Manchester City are currently trailing to Swansea. Now this is a Match of the Day you don't want to miss. BBC One at 22:20 GMT this evening. It's now Swansea 2-0 Manchester City!!! More from Burnley manager Sean Dyche: "You need results, we are in a tough spell now and you want to come away with something especially against 10 but it is no ‘gimmee’. We did a lot right, but you have to score goals, simple as that. We created enough chances to at least nick a goal but that wasn’t to be. "The margins are tight, you are never a million miles away, we have had four tough games to take, before that eight great games. The twist of that is close but you have to get it right, the details have let us down again today, forget about the 10 men, we gave away a corner and you cannot afford to do that in the Premier League." More from West Ham's Mark Noble: "I'm still trying to figure what went on to be honest. "We were pushing to get the second and they scored a breakaway third goal and I think everyone thought it was over except us. "We dug ourselves out and in the end, even though it was tight, we deserved the win. "I'd take a 1-0 win over that all day long - especially when we go 3-1 down. But at the end of the day that's the Premier League. No game is easy and you have to turn up. "I'm pleased we've kept our run going at home and we needed to bounce back after Cardiff last week." The second FA Cup quarter-final of the day is under way and Swansea have just taken the lead against Manchester City! Head over here for Steph's live text. West Ham skipper Mark Noble: "We knew the stats before we came into the game and they scored two set plays and on the beak away. "To be honest they didn't have a lot more than that - there was a lot of rolling around. But we got our goals and one in injury time so what goes around comes around. "We're over the moon. We're buzzing but we shouldn't really be because we shouldn't have conceded three goals at home. But other than that we did OK.
"The best of the rest is going to come down to the end of the season. In honesty, the way we started the season to where we are now, pushing for a European spot, it's been a good season." Burnley manager Sean Dyche speaking to Match of the Day: "It can play with you psychologically when someone gets sent off so early, and we didn’t get to grips with the game in the first half. "Our use of the ball wasn’t good enough, we didn’t create enough chances, we created a few ‘maybes’ second half we adjusted and kept the ball better and we knocked on the door enough certainly not to lose the game. But we didn’t find the really good moments of quality to win the game. "You cannot go on about conditions, both teams have to deal with it. You are always wary of a set piece when it’s a tight game and they have 10 men, but they stayed resolute, kept it hard as a unit and we didn’t find a way of breaking it down." More from Rafa Benitez on Newcastle's performance: "The performance of the team was very good and then everything changed in the first minute of the second half and we would like to have these situations fairer in the future. It changes everything in the second half, we were winning one nil and you can take risks and we were not very happy after that goal. "But it is not the first time we have had difficult situations and the reaction has been very positive. "Bournemouth are a good team and they attack quite well and we did what we had to do to create chances . "Defenders did well against a good offensive team and it was not easy for them but they did well. It’s a great goal [from Ritchie] and we were pushing until the end. That is football." Newcastle manager Rafael Benitez speaking to MOTD on the Bournemouth penalty decision: "Some decisions you need to have VAR and you have to make sure you get the decisions right. "There were too many decisions that didn’t go our way today. To be sure for the future and we can improve that. "I will have to check but if you give a penalty like that, then you have to give 100 in every game." Rafa Benitez has just said "that is football" and that is basically Jan Siewert's post-match team talk with his Huddersfield team. "We defended really well today they [Newcastle] play a good system, that can give you problems and it looked like the points were ours. "Solanke and Josh King showed real quality for that second goal and that’s what you want to see. It wasn't a perfect performance." More from Huddersfield boss Jan Siewert, speaking to Sky Sports: "I have thousands of thoughts to be honest. It's hard to describe this result at the end. "I don't want to talk about the best performance I want to win games." All 52 of West Ham striker Javier Hernandez’s Premier League goals have been scored from inside the box. 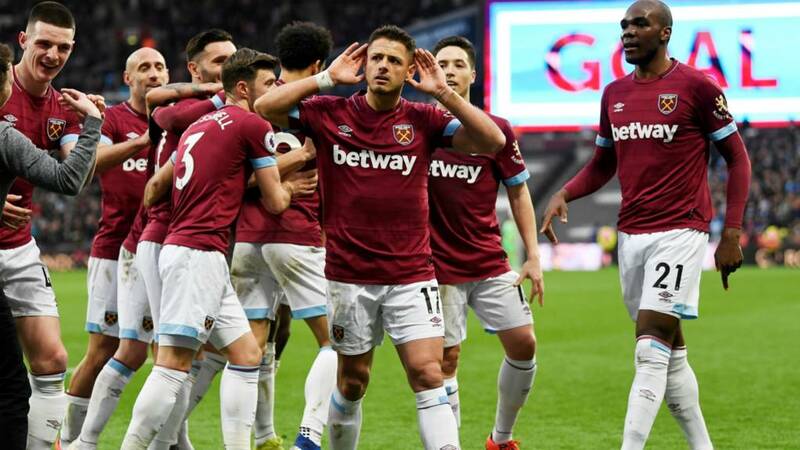 He also became the first West Ham player to score two headed goals in a Premier League match since Michail Antonio against Watford in September 2016. Huddersfield boss Jan Siewert speaking to BBC Sport: "I worked everything out to give my players a possibility of winning here and they showed it - we were winning 3-1 but then they lost it with three situations. For me it's hard to describe at the moment. "Can't you see on my face that I'm not totally disappointed? We were leading on the pitch - we scored three goals - something we haven't done already this season. And then we lost it. "I haven't spoken to the players yet. I will speak to them now. "I think the supporters are amazing for us. They are so amazing. I went to them and took my hat off to thank them. I will continue working hard and the most imporant thing is we have seven games left to represent the club. I'm disappointed and to be honest I can't believe it." Lewis Sullivan: That West Ham game is why I love football! AbuSufyan: Crazy games today just shows how unpredictable the Premier league can be. Bournemouth manager Eddie Howe speaking to BBC Match of the Day: "The [Salomon] Rondon goal was a well executed free kick and we should have dealt with that better. "We were much better in the second half. We played with a quicker tempo and the conditions suited us better. I haven't seen the penalty decision back but we were much improved." On double goalscorer Joshua King: "Josh is outstanding physically, technically and mentally - he has the complete package, a little bit of everything. "He wants goals to show that potential is so high with him. He took the penalty well and the second goal was a great finish. "The fact we haven’t won is the most disappointing thing today, when we were so close." More from West Ham manager Manuel Pellegrini: "I think this is a match for the fans. I think everyone was disappointed when we were 3-1 down but we did well to come back." Were you angry? "Of course. We told them this is a team that plays well - they don't score many goals but they do well from set-pieces. "For our team it is really important to have a big squad. As a substitute you can turn the game as Samir Nasri, Javier Hernandez and Lucas Perez did today. "Really I hate it when my team play bad. Winning or losing I want to play well. But winning is the important thing. Winning 4-3 and scoring three goals in the last 10 minutes is good for the team and good for the fans." Leicester manager Brendan Rodgers: "I said that when you come to Burnley, you don’t get points just for style, you have to be resilient and have spirit. It was an outstanding mental game, especially when you lose a player early. Jonny [Evans] and Wes [Morgan] were incredible, and the guys worked together as a team. We took our chances well. "We stayed calm. When we were down to 10 men it was about having that energy and positive attitude, I was pleased with them at half time, they carried it out tactically very well with 10 men. We have the resilience and spirit in this squad. "When I arrived I said we wanted to finish as strong as we can, carry a good momentum through into pre-season and next season. Over the last couple of weeks, training has been really enjoyable as they want to learn and develop, and they got their rewards. "Wes [Morgan] epitomises the humble attitude of the group, he was a player I wanted to keep, he is a wonderful symbol of the changing room. He’s a really, really good guy. I am so happy for him and he got a round of applause in the changing room after which he deserved as it was a fantastic header." West Ham manager Manuel Pellegrini: "I think it took a lot of character. We never gave up when we were losing 3-1. "This is a team that plays well from set-pieces and they did that today. The reaction from our team was good - we knew it would be difficult to turn the score - but we tried and we did. "Javier played well in the past games but he was maybe under pressure to score. Now he has come off the bench and done well and scored two goals. Lucas Perez was also dangerous. I think the three substitutes did well and that's why we have a big squad. "Maybe it was not Marko's best game. But the whole team did not do what we need to do in the first half. It's a team performance - I cannot divide the blame. "Between now and the end of the season we have one objective; to beat Everton here and then it's the next game. We have to keep adding points and we have three big games away."